Success! TSOT Ruby on Rails Project Night will be back EVERY month! TSOT, Inc. opened the doors of their brand new ‘developer playground’ to Toronto’s tech elite this Tuesday for the premier of TSOT’s Ruby on Rails Project Night. As TSOT’s VP of PR, I was lucky enough to coordinate the event and got to meet tons of key players in Toronto’s tech community! Thank you to everyone in attendance at the first TSOT Ruby on Rails Project Night this past Tuesday. The evening was a great success with demos from Andrew Burke, Hampton Caitlin and Mike Ferrier (thank you guys, great work) and the MC stylings of TSOT’s own Joey deVilla. 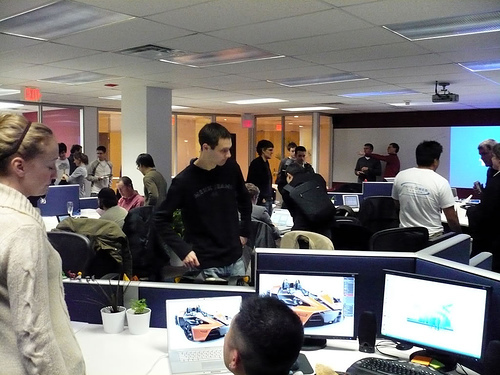 With over 40 of Toronto’s tech elite comfortably filling TSOT’s new office, we couldn’t have asked for a better crowd!Please mark your calendars Tuesday February 12th for our next TSOT Ruby on Rails Project Night, which promises to be another great event for Toronto’s tech community. If you are interested in presenting at a future event or learning more about TSOT, please contact me, Corina at (416) 908-6082. Thanks again to everyone and see you Feb. 12th! Social Media IS the Banana!